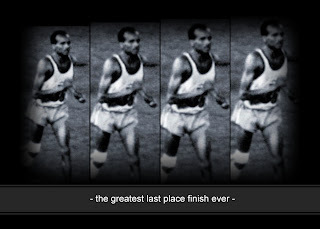 And then, nearly 2 hours after his fall and about an hour after the first runner crossed the finish line– Ahkwari would have his moment of completion. Could he have known that what began as an unceremonious entrance into the Olympic stadium would inspire and lift the hearts of so many? From the dark of night, off the streets of Mexico, into the blasting white lights of the stadium, Ahkwari made his entrance– alternating a spirited jog to a walk-run. The thousands of spectators that were speckled among the stadium seats there to watch an entirely different Olympic event, took notice of this gentleman making his final stretch to the finish line. One lone competitor, competing not against the other countries that began the race with him, but the race for his dignity, character or the pride of his country. THESE are the things John Stephen Ahkwari valued most and they were his strength as he ran the final leg with his bandages and wounds. Imagine the moments that followed…. the applause began…. and got louder as he made his way around the track. People began to stand and holler words of encouragement and the applause heightened to a full burst. Crossing the finish line was not an act of ego, it was an act of pride–honoring what John Stephen Ahkwari valued most. The most powerful part of this story is in its closing. After he received medical care and the questions of his run were asked, many asked why he kept running. Why did forge forward even in such tremendous pain that surely all would understand his not completing the marathon? You can do so much when you connect to your values. Even when things seem hard or impossible, the power of values seems to boost the odds. Living a values based life is a great way to do the impossible, to inspire, and to have a great deal of fulfillment and satisfaction. Watch this and see the powerful driving force that comes from acting from values.